Carving with a utility knife? In my opinion, a utility knife is a step up from a Flexcut knife. I modified a Stanley 106 knife, I think it is, to make the blade stick out farther. With that said, I use a utility knife when I am carving in wood that may have some issues. like driftwood, etc. I am currently carving square yard sticks, and the wood is a bit harder on the older sticks. I use the utility knife to do the rough out work. What you don't want to do, if you choose to carve with one, is use the thin blade break off models, or use the retractable models. 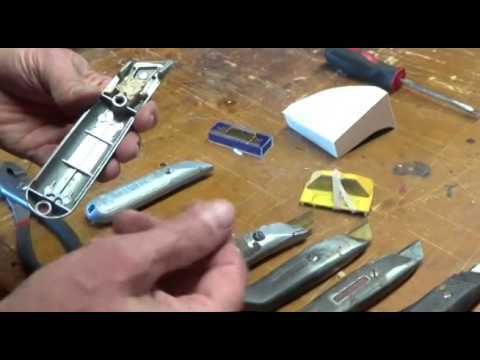 I have used a Stanley fixed blade #199 utility knife for many years. It is a good tool to have in a carving box. I do not have the skill Lynn D. I use with harder wood where I do not want to risk an expensive carving knife. When I was young - like in middle school - I used a boy scout knife. The items were a bit ragged but the paint (poster) was just as ragged after years. A sharp blade and generally a small one taking small chips. Larger ones can be added but can be lived without for a while. There has been remarks on this forum about not cutting toward your body like Lynn does. Lynn also notes that to never use a utility knife that is not fixed blade ....it is too dangerous if it can move. Last edited by Dileon; 11-09-2018, 12:04 PM. When I explain carving to anyone, I tell them to start with a Murphy style knife. Reason number 1....cost. Reason number 2...learn to sharpen and hone a knife before you proceed. Reason number 3...size and fit in a persons hand. If you decide you are not as interested as you thought you were, you don't have a big amount invested. Better to learn to sharpen on a less expensive knife than a 40-50$ blade and mess it up. If the knife isn't comfortable, try a different shaped or size handle, then again, if your interest is increased. After all, man only used to use a pocket knife. Then again, before that, all man had to carve with was a sharp rock. Plus the use of the right wood to learn with. I would not start with cherry or oak and a dull blade.